Tip: If you're not sure what types of archives there are in WordPress, take a look at the glossary or this basic information about WordPress indexes, archives, and posts. The Archive-type layout in Beaver Themer applies to the content area in which WordPress generates lists of posts. Here are the types of archives that WordPress generates by default, how to find an example of each, and which Location setting to choose to limit the Archive Themer layout to this type only. The blog posts index is the generated list of posts that appears in reverse chronological order on the page that you designate as your blog page: either on the home page of your site or a regular page that you specify in Settings > Reading. For example, the following screenshot shows that the blog posts index has been set to a regular Page titled "Blog." A website can have only one blog posts index. The Themer Location setting to choose for this type of archive is Post archive. An author archive is any list of posts by a single author. If you click an author's name in a single post, you'll see an author archive. Choose Author archives in the Location field to make the Themer layout apply to all author archives. A date archive is any lists of posts within a particular date range. The WordPress Archives widget displays year and month dates. Clicking any link there will take you to a Date archive page for that month or year. Choose Date archives in the Location field to make the Themer layout apply to all date archives. When you use the built-in WordPress search, which you can enable in your theme or by using the WordPress Search widget, the display of posts in the search results is just another type of archive. Choose Search results in the Location field to make the Themer layout apply to all WordPress search result archive pages. A post category archive lists posts that are assigned to a particular category. The WordPress Categories widget lists all the categories used in your posts. Clicking one of the category links in that display will open a post category archive page. Choose Post category archive in the Location field to make the Themer layout apply only to category archives. You can further refine where the layout appears by selecting a single category from a submenu. Choose Post tag archive in the Location field to make the Themer layout apply only to tag archives. You can further refine where the layout appears by selecting a single tag item from a submenu. If you create a custom post type, the name will show up as a separate group in the Location list on the Themer layout editing page. If you create categories or tags for your custom post type, the custom category archive or tag archive also appears in the list. This also applies to plugins that create their own custom post types, such as the WooCommerce plugin, The Events Calendar plugin, and the Easy Digital Downloads plugin. See the Related Articles for how to create Archive Themer layouts for these plugins. To create an Archive layout for more than one location, you can click Add location rule to add another location selection. If you want the Archive layout to apply to all types of archives, you can choose All archives in the Location field. In this case, the Archive layout applies to all archives for standard posts and all archives for any custom post types. For example, if you have both a standard blog and WooCommerce products, an All archives location applies to all the standard posts archives plus the Shop page, product category archives, and so on. In this case, you can also set up exclusion rules. For example, you could set a Location rule that applies to All archives and then create three exclusion rules: one for the WooCommerce Product archive, Product category archive, and Product tag archive. If you use a Page Builder Posts modules on a regular page to create an archive, it's not a true WordPress-generated archive page, so the Archive Themer layout will not apply. For more information, see the article about configuring how WordPress handles your blog. You can display an archive of posts in a single category but you can't display an archive page with a list of categories. 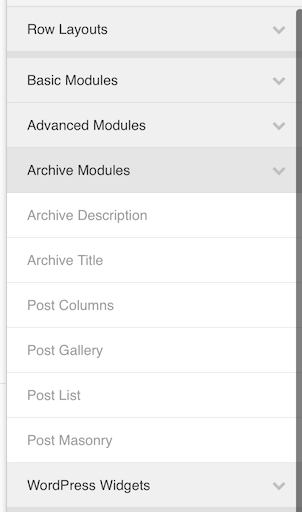 When you create a new Archive layout, the initial layout contains the following rows and modules. A row that contains the Archive Title module (which is actually a Heading module with an Archive Title field connection), and a Separator module underneath it. The Heading module has a top and bottom margin of 100px, which you can change on the Advanced tab. 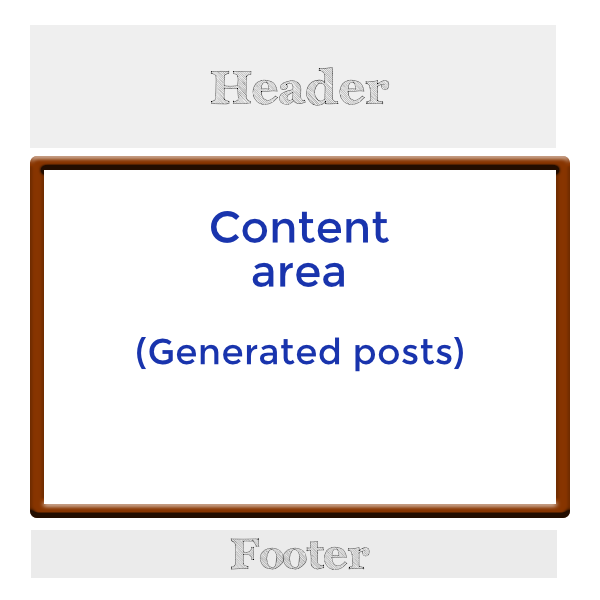 A row that contains a Posts module with a List layout. You can change to any of the other layout types by opening the module and selecting a different one in the Layout field. Or replace the Posts module in the initial layout with one of the other Post modules in the Archive modules section of the Add Content panel. See the Related Articles below for information about each of these special modules for Archive-type Themer layouts. Tip: If you ever want to revert to the default Themer layout for your Themer Archive layout, open it in Page builder, then click the Templates tab in the Content panel (Page Builder 2.x) or click the Templates button (Page Builder 1.x), then click the Posts template.